Anyone aware of last year’s reports about Russian hacking of the Democratic and Republican parties’ computer networks will be familiar with the term “cybersecurity.” As hackers attempt to invade network systems via the Internet – to either damage them or steal proprietary information – cybersecurity has become among the highest priorities for governments, corporations and many other types of organizations. David Schuster, an SJSU faculty member since 2013, won a National Science Foundation Early Career Development Award grant of $516,000 over five years to conduct research on strengthening cybersecurity and computer network defense. The approach that Schuster and his team of SJSU students are taking in their research is very different than what most people might expect. Schuster is an assistant professor of psychology – not computer science or information technology. Schuster and his 14 assistants – seven graduate students and seven undergraduates – are focusing their research on the people hired to defend computer networks, not on the technology itself. 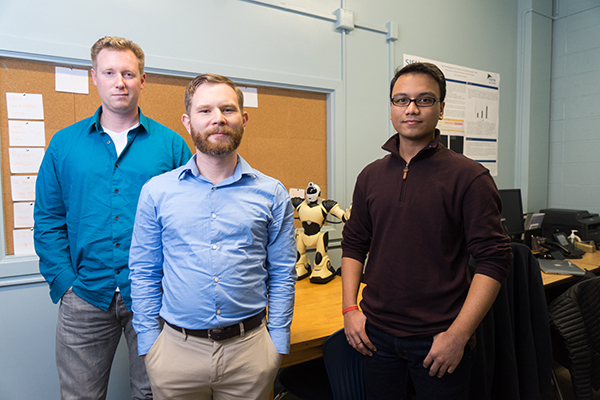 Two of his graduate students are paid through research assistantships, while two undergraduates are compensated through scholarships; other students are volunteers. They all are dedicated to their research assignments in the Virtual Environments, Cognition and Training Research Laboratory managed by Schuster, located in the newly renovated Dudley Moorhead Hall. Schuster notes that no organization can protect its computer network by simply using or turning on some security software. Soham Shah, an undergraduate majoring in computer science, said he spends 10 to 12 hours per week working in Schuster’s lab. The research matches his intellectual passions. Ian Cooke, a second-year graduate student working on his master’s degree in research and experimental psychology, feels the tasks he takes on in Schuster’s lab are a perfect fit with his interests and goals. Ultimately, Schuster’s goal is for their research findings to help determine ways for cyber security employees to make better decisions that more effectively protect their organizational computer networks. Good work Dr. Schuster and your team! Very exciting. Another excellent article by Mr. Zepel who made this complicated subject understandable.